A German news outlet reported earlier that VW CEO Herbert Diess has rejected the committee's request. WASHINGTON -- Volkswagen AG said a hearing for which the U.S. Congress is seeking testimony from its CEO is "not necessary." 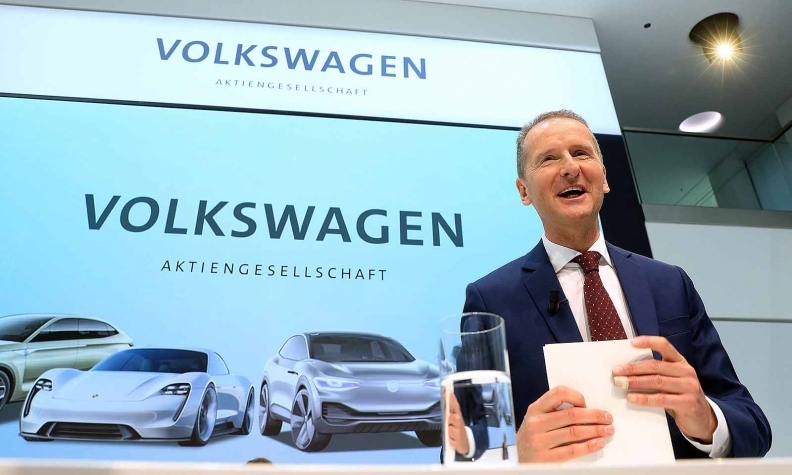 The House Science committee last month asked VW’s Chief Executive Herbert Diess to appear before the panel which has opened a fresh probe into allegations the German automaker has continued to skirt environmental regulations overseas. VW has been corresponding with the committee since the request "with a view toward satisfying the Committee that a hearing is not necessary," VW said in a statement released from the U.S. The company did not officially decline to have Diess provide testimony, Jeannine Ginivan, a U.S.-based spokeswoman said, noting that the committee’s request lacked a subpoena. A German news outlet reported earlier that Diess has rejected the committee’s request. Volkswagen "continues to cooperate with all relevant authorities interested in following up on the resolution of the diesel issue," the VW spokeswoman said. "The committee is reviewing VW’s response and considering next steps as we continue to gather the information necessary for our work," Thea McDonald, a spokeswoman for committee Republicans, said in an email. "The committee will continue its oversight of the potential for advanced technologies to circumvent regulations and create unfair playing fields." VW legal chief Hiltrud Werner told shareholders in Berlin on Thursday that there have been requests by Congress but "it’s currently not foreseeable if there will be a hearing." Volkswagen admitted in 2015 to rigging 11 million diesel vehicles worldwide with software to cheat on emissions tests, a scandal that upended the automaker, led to the resignation of its CEO and cost the company more than $30 billion in fines from authorities and other associated costs. In an April 12 letter to Diess, U.S. Rep. Lamar Smith, R-Texas, the chairman of the House Science Committee, said the panel was investigating reports that Volkswagen "continues to circumvent global emissions requirements." The letter asked Diess to testify before a June hearing in the works on the use of "advanced technologies to circumvent regulations," according to the letter. Smith conceded last month that the chances of Diess testifying before the committee were "probably not great." "It’s a little hard to subpoena someone overseas," Smith said in an interview late last month.